I want (inside the image) to move in the middle h1 and h2 and change font etc. not what you show in your post above. You need to change your Codepen first. In-line styles take priority over css selector definitions. You need to remove the in-line style of style=“color:white” before the h1 selector definition will apply. Apply what you have learned from my post to the h2 element. 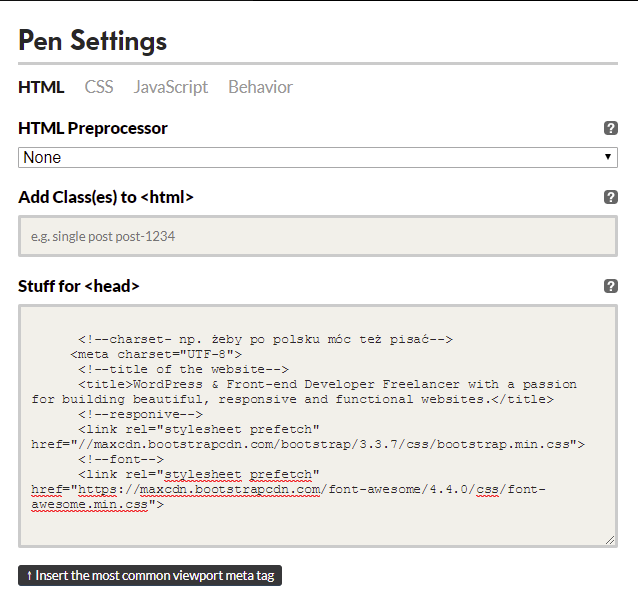 EDIT: Also, since you are using Codepen, you need to move all the stuff between (but not including) the <head> and </head> to Stuff for <head> section of the HTML Pen Settings (see screenshot below). Thank you very much for your answer! Really appreciate! And again,thank you for your help!